Flamenco has shaped my life's history. It is my great passion. It excites my mind, it enraptures my soul and comforts my spirit. Through flamenco I find truth, beauty and goodness. Good flamenco is always stirring to the listener who hears with their heart. It communicates beyond what words can describe and beyond what movement can say. It is the language of the soul. Flamenco is more than a profession to me, it is a way of life, and it permeates my personal and professional life through its philosophy of honesty, dignity and integrity. I believe that one does not have to be a performer to be "a flamenco". 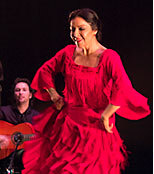 A flamenco is anyone who is emotionally and actively involved in this philosophy. 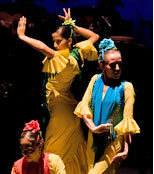 The art of flamenco is merely the outward expression of the flamenco way of life. 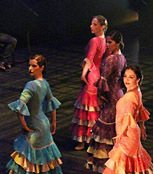 The award winning Esmeralda Enrique Spanish Dance Company was founded in 1982 under the artistic direction of Esmeralda Enrique and has a history rooted in flamenco and Spanish Classical dance. While maintaining the tenets of traditional flamenco singing, dance and music, the company presents a style that holds in perfect balance tradition and classicism with a contemporary aesthetic. EESDC has been presenting an annual Toronto Season since 1990 and has developed an ever expanding repertoire that has earned both critical and popular acclaim. With unique, talented dancers and musicians the Company is recognized for the exceptional level of their productions receiving two Dora Mavor Moore Awards in addition to numerous nominations over the years, NOW Magazine readers voted EESDC Toronto's Best Dance Company for 2015. Passionate and driven, the Esmeralda Enrique Spanish Dance Company continues to enthrall audiences with its commitment to imaginative choreography and artistic excellence. The Academy of Spanish Dance was established by Esmeralda Enrique in 1982. A sound training in flamenco, classical Spanish and regional dance is offered to all students whether they take class for recreation, to gain grace and poise or with the hope of pursuing a professional career. Working closely with dedicated teachers, our students are stimulated and challenged in a positive atmosphere. The satisfaction that comes with achievement benefits many other aspects of their lives.